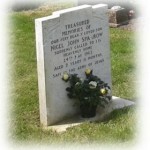 Please do make sure that you keep all flower and plant containers within the area of the headstone so that the grass can be cut easily. We know that many people who visit and leave tributes do not live locally. For that reason, we try to remove flowers that are well past their best and seasonal tributes at the end of that season. If you visit frequently, please do make sure that yours are removed to the bin area, which is next to the south wall of the Church. Make sure that only vegetation is put in the brown bin. Plastic wrappers, plastics flowers, foam, dead wreaths, etc. should go in the black bin or taken home to be disposed of. The following are not permitted: Curbs, railings, plain or coloured chippings, containers of any kind, free-standing vases or glass which are particularly dangerous, figure statuary, open books, birdbaths, pictorial etchings, memorials in the shape of a heart, cameos, portraiture or photographs. Churchyards are a valuable possession and a great responsibility. They can easily be spoiled by unsuitable gravestones and memorials. The Chancellor of the Diocese of Derby has therefore made regulations which are designed to assist all those who are concerned with the erection of memorials and gravestones to ensure that they are appropriate and will harmonise with the natural local landscape. Compliance with the Regulations will enable the formalities to be completed without difficulty. Only parishioners, including those on the Church Electoral Roll, or dying in the parish, have a right to burial or interment of ashes in the churchyard, if there is room. Nobody else has that right, although in very exceptional circumstances permission may be granted for the burial of those otherwise excluded. 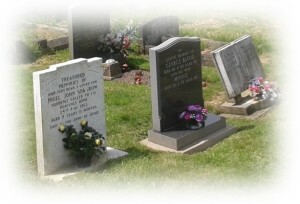 A right to be buried in a churchyard does NOT however include the right to erect a memorial or gravestone to the deceased. Ashes may be interred in an existing grave if all parties agree and there is room. Please note that the existing Memorial Garden is now full and a new area has been set aside for interred ashes. 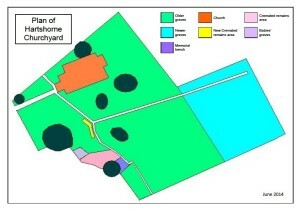 You can see where this is on the plan of the churchyard below. For details of graves in the new part of the churchyard and the Garden of Remembrance see the Help in finding someone’s grave page. If you are researching your family tree and want to find out more about burials in St Peter’s Churchyard, please look at the Family History page.